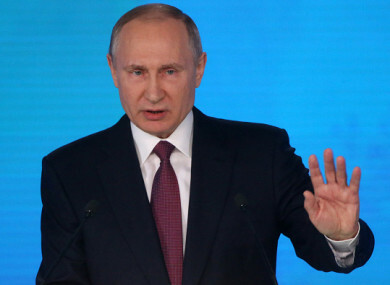 RUSSIAN PRESIDENT VLADIMIR Putin has boasted the country has developed a new generation of “invincible” weapons in his state of the nation address today, warning global powers they must now reckon with Moscow’s military might. Putin used the address to outline economic, and social policy ahead of his widely expected return to the Kremlin in the 18 March election, but nearly half the speech was dedicated to Russia’s top-notch weaponry. The president usually delivers the annual speech in the Kremlin but this year spoke from a nearby exhibition centre – allowing him to show a series of high-tech video montages of missiles manoeuvring across mountains and oceans, and heading over the Atlantic. Putin quoted a speech he gave back in 2004, saying that Russia would develop a new generation of weaponry, a promise that he said has now been fulfilled. “No one really wanted to talk to us basically. No one listened to us then. Listen to us now,” Putin said, prompting a standing ovation from the audience of top officials, lawmakers and celebrities. Putin showed tests of a new missile system that he said could fly at 20 times the speed of sound and manoeuvre up and down and is not owned by any other country. “This makes it absolutely invincible for any forms of air and missile defence,” he boasted, calling it an “ideal weapon”. He also praised a new generation of young scientists working on such weaponry, calling them “the heroes of our time”. Putin, who has led Russia for almost two decades and is seeking a historic fourth Kremlin term that would extend his rule to 2024, also laid out a number of social, economic and environmental measures. In the absence of any programme and with Putin having refused to take part in TV debates with other candidates, the address suggested cutting poverty and improving the environment would be top goals for his expected new six-year term. The 65-year-old said he aimed to cut the country’s “unacceptable” poverty rate in half over the next six years, but said 22 million fewer Russians were now living below the poverty line than when he was first elected president in 2000. “The well-being of Russia and the well-being of our citizens must be the foundation of everything, and it is in this area that we must make a breakthrough,” Putin said. He also promised further regulations for businesses in order to reduce industrial emissions, as he spoke of millions of people forced to drink water “that does not meet standards” and “black snow” in the Siberian city of Krasnoyarsk. “People in industrial hubs can go for weeks without seeing the sun because of smog,” he said. Putin was given an ecstatic reception in the hall during the televised address but some online comments were less enthusiastic. “The old man only perked up when he was talking about how he can destroy the world. A moment of truth!” said political analyst and former Kremlin advisor Gleb Pavlovsky on social media. Despite campaign promises when Putin returned to the Kremlin in 2012 after four years as prime minister, his last term was marked by a fall in living standards and Russia’s international isolation, critics say. Boosted by a slavish domestic media and foreign interventions, including the annexation of Crimea from Ukraine in 2014, his approval rating remains sky-high and official polls suggest he is likely to take 70% of the vote. Email “'Listen to us now': Vladimir Putin says Russia now has 'invincible' weapons”. Feedback on “'Listen to us now': Vladimir Putin says Russia now has 'invincible' weapons”.